The ME100 has a modular architecture built up from separate detection modules (DM). 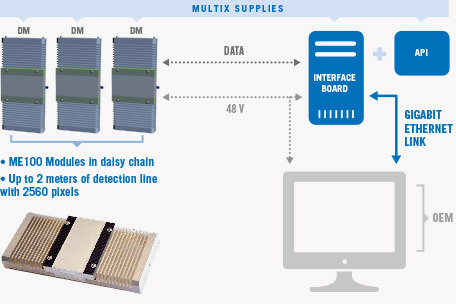 Each module contains a 10cm-long array of 128 pixels (800μm per pixel) and can be daisy chained up to 19 other modules to form a 200cm linear detector array. The data is transferred to the host system via an interface board using a Giga-Ethernet link. A MultiX API (Windows or Linux compatible) residing on the host computer controls the data flow and format. The ME100 measures the energy of each photon and reconstructs the spectra over a maximum of 256 energy bins between 20 and 160 keV. The number of energy bins is flexible and can be configured to match the host systems data transfer and processing capacity.